No pictures today. Just a wheel in motion all afternoon as the sound of drumming rain comes in from the kiln porch where a glaze kiln is cooling. Perfect. Time for mind and hands to come together over a soft undulating mound of clay. No other pots to glaze or trim or detail. Nothing else between the clay and me. A sketch of experimental pots in front of me, pushing the limits for a set of canisters for Carole. More wall vases to explore glaze combinations. Squared off plates as part of a set of dishes for Nan. Shows, finished wares, pots in the appreciative hands of people, all reduce down to this--the rhythm of the wheel and clay. Don't get me wrong, I love handbuilding but it is a different pace and a different rhythm. Beautiful. This is why I got into clay and why it still ensnares me in it's magic. 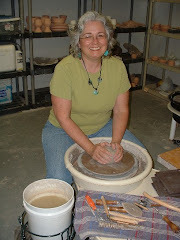 The rhythm of the wheel and clay. gave me this tip a while back. I used to use clothespins, but when the cane is too thick they tend to fly off at the most inopportune moments. I'll have this one and some more pieces at the Claymatters Barn Sale on Monroe Rd. in Charlotte on Saturday. Will post a few more images of HOT out of the kiln work later.